…I have to take our friend George Takamoto to SeaTac, then, because I have a job over near Manchester, and there’s a ferry that goes there, I get to listen to the game instead of watching. Not that I wouldn’t trade watching for surfing, but the big blob of red, almost-purple, did not, as I hoped, move to a better angle to cause the Strait to work. Not that others weren’t checking the buoys; or even driving, walking, looking; each surf fanatic hoping; all using their mind-power, singular and collective, to achieve victory. Yeah; my friend Archie was out surfing on sub-one footers, reported there were a lot of people looking. I checked-out the spot I thought had the best chance of receiving an off-angle swell. Nope. VICTORY! Oh, maybe, with the swell angle still around 220, I’m now switching my mind power to the Seahawks. 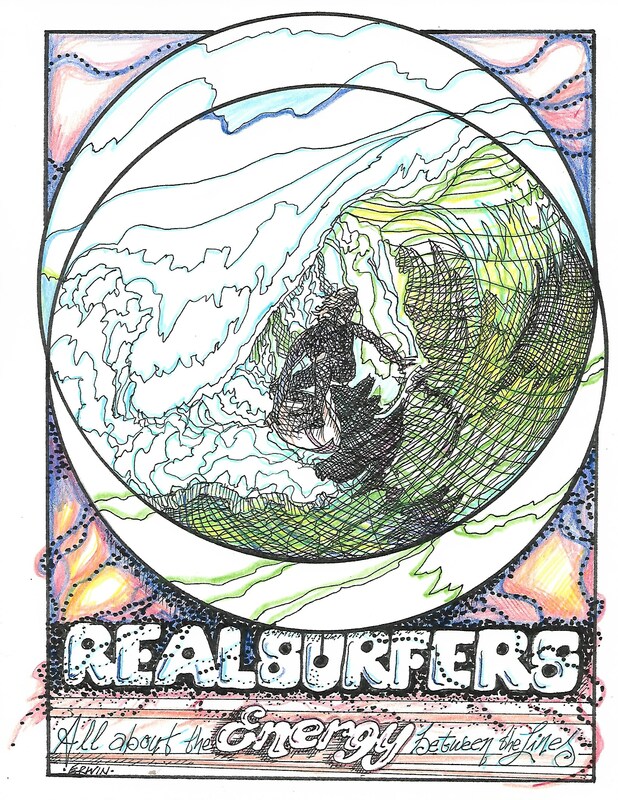 I actually googled “Seahawks real surfers” to get this drawing, rather than searching for it, realizing it’s probably saved on some unsaved computer, somewhere in a drawer or on a shelf. Now I’ve got to go. I tweaked and beat on and finally got the radio in my Toyota to 97.3. We never seem to like the commentators on the network coverage, but we always love Steve Raible and Warren Moon’s announcing. Totally biased. As are we. How do we spell VIC-TOR-EEEEEEEEEE!? The actual drawing is a bit too big for my scanner. This is, however, most of it. Thinking posterization, I started the drawing on Saturday, worked on it off and on, then, up early on Sunday to maximize the pre-game preparation, I added more up to and during the Seahawks/Vikings game. When I decided, sometime after my wife, Trish, decided she couldn’t watch any longer, probably about the end of the third quarter, with the Seahawks behind 9-0, that I should pay more attention, give a more focused fan, um, whatever it is fans, and, in particular, fans watching on TV, might be able to contribute to a team effort, I set the drawing aside. I went back to it before and after dinner, put my name on it some time during our delayed viewing of “Downton Abbey.” Look for a color version some time before the Seahawks take on Carolina next Sunday. I’ll be listening to most of it on the radio, cosmically cheering, as Trish and I have decided we can’t really watch close games together. GO HAWKS! Meanwhile, I’ve been trying to will some favorable buoy readings. Okay, I’ll focus a little more; see how that works. Back at Palomar Community College, taking all the art classes I could get into, I never quite fit into the scene. 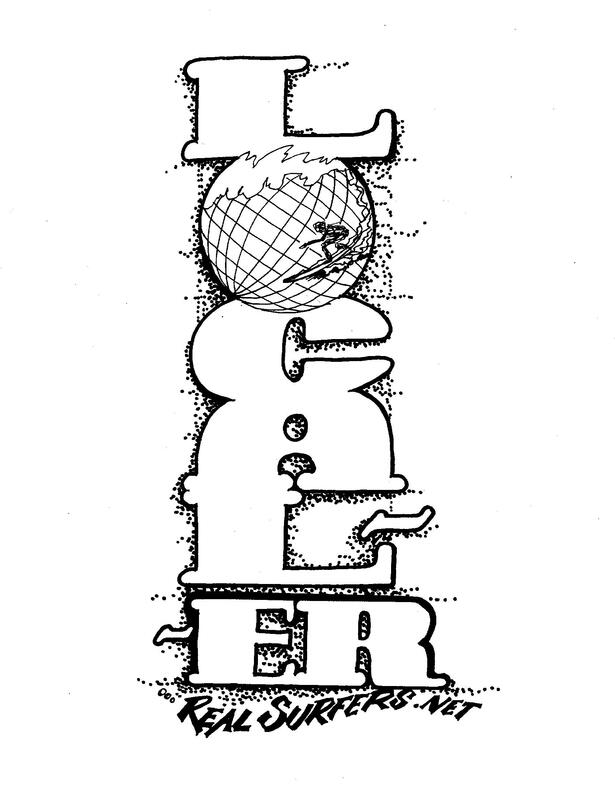 This was 1969-71, and it seemed more important to look like an artist than to actually turn out something original or real. Things haven’t changed that much. I really started this paragraph to say that I also took creative writing; also didn’t seem to fit in. 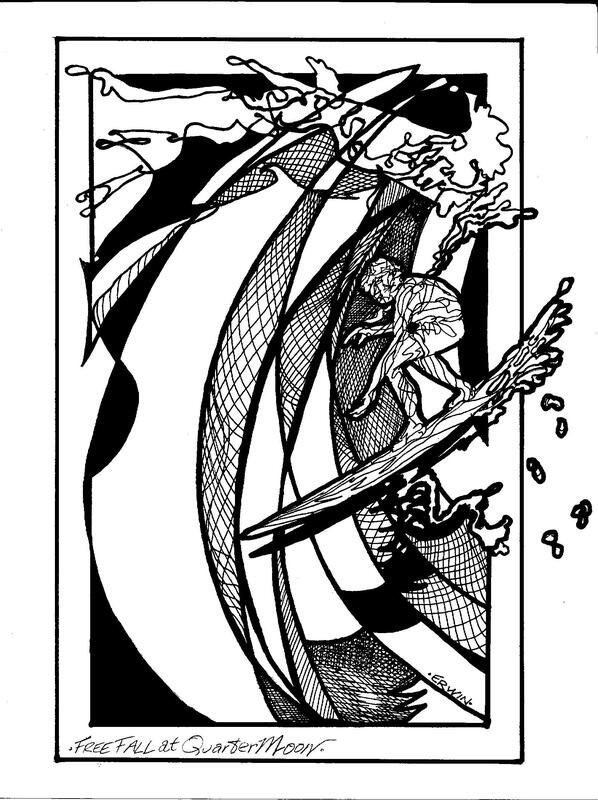 Thing is, the artists seemed to think I was really better suited as a writer, the writers (not that I asked them, it was painful enough to act like I didn’t hate their stuff) seemed to think I was more an artsy guy. The problem persists. 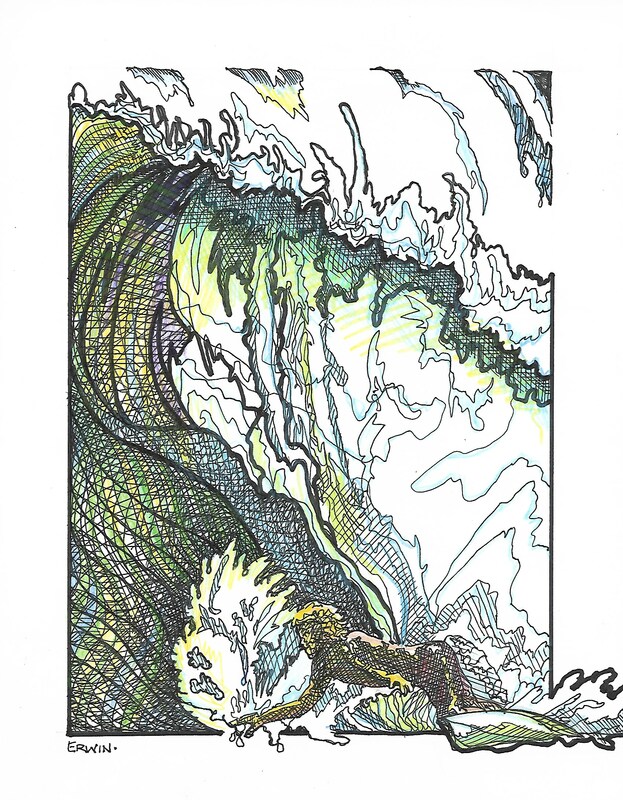 It should be noted that my drawing is more influenced by Rick Griffin’s work in “Surfer” than anything I learned in class; my writing… well, nowadays I just write the way I want to write. But let me add, I so appreciate any image, verbal or visual (include music and song and, sometimes, smell) that causes me to stop for a second, or longer, just to enjoy; temporarily overwhelmed. I plan on adding some color to the ones that are still black and white. And I have more to work on, while, meanwhile, I’m working on a drawing that might be my Christmas (or fill in your choice of solstice celebrations) card. I’m imagining a view from the back of a wave, with the Olympics in the background. I’m having some trouble finding reference material for something from that vantage point. But, I’ll pay more attention next time I go surfing. 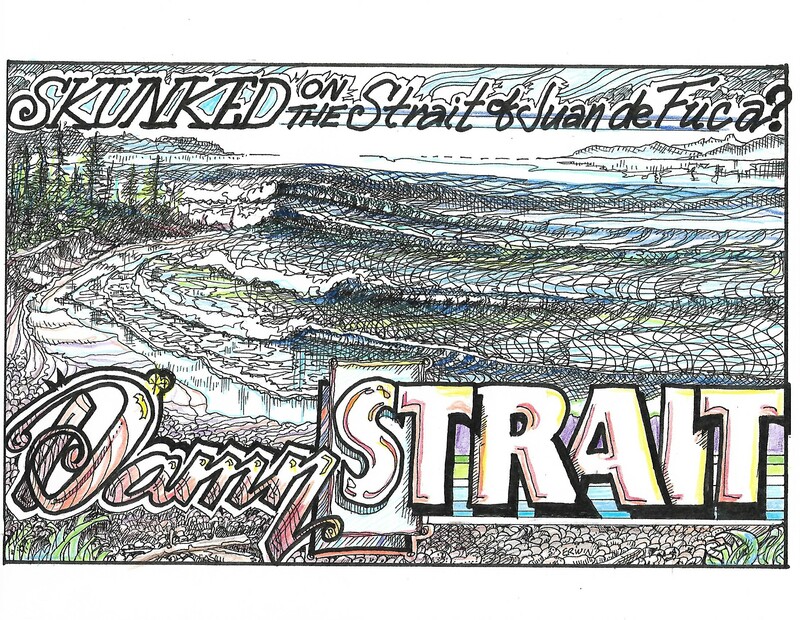 I’ve been trying to come up with a line that conveys the message that there are never any decent waves on the Strait of Juan de Fuca; or if there are, they’re rare fickle and probably not worth the effort of looking for them. Everyone who has tried a few times has been skunked on a percentage of these trips. The drawing is utter fantasy. Sometimes the waves are, too. As with everything, working on it. Since I fired up the printer/scanner, I figure I should add at least one more so I can do a medium size; something one can look at without moving the image up and down. The waves may be going off right this minute. Somewhere, they no doubt are. Not that it’s all that relevant, but, after getting the drawings reduced and a couple of copies at the Fed-Ex/Kinko (unless they’ve dropped the Kinko altogether) yesterday, I made some inquiries as to what it would cost to put together a little book of illustrations. I discovered that… well, my second or third question was, “Then how does anyone make any money with books?” “Um, maybe a… printshop? Volume? Um; hey, we don’t know. That’ll be $3.66 for the copies. Oh, and you have some pens?” This morning I discovered the pens that make that in-between line I really need, the two-pack… blue. Not black. Blue. Blue like one gets from a trip to the Strait. Maybe the good kind of blue. Damn, I could have been there by now. Sorry, I was just interrupted by Adam Wipeout. “I think it’s firing.” Bluer. I ran into Andrew, another house painter, up in Port Townsend yesterday. Checking out a historic building in the Uptown area, stepping back into the street, I practically ran into him as he got out of his car. We had passed each other at the paint store, but this time he was out of costume and carrying a small painting on canvas. It was a scene of this very street, almost black and white. Because I have questionable social skills, I took it from him, checked it out. “Realsurfer.net” has always been a portfolio builder for me. And, with longer nights, I’ve been on a bit of a roll, lately. Trish recommended (strongly) that I not add color to the drawing above. I thought it looks ‘beatnik and 1959-ish,’ she says it’s Art Deco-ish. I probably will make a copy and color that. Oh, more than probably. While the top drawing evolved from a sketch, the lower drawing came from some reference material; specifically a photo of Kahea Hart at Backdoor Pipeline by Pete Hodgson/AFrame. 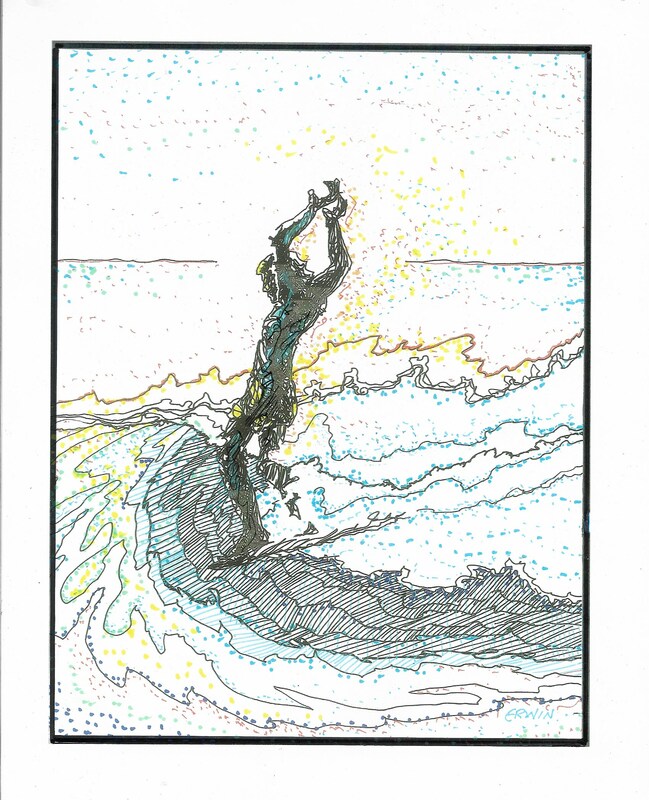 This time, because Trish had trouble discerning the surfer’s head from the background, she insisted I add some color. No, I didn’t make a copy first. Darn. 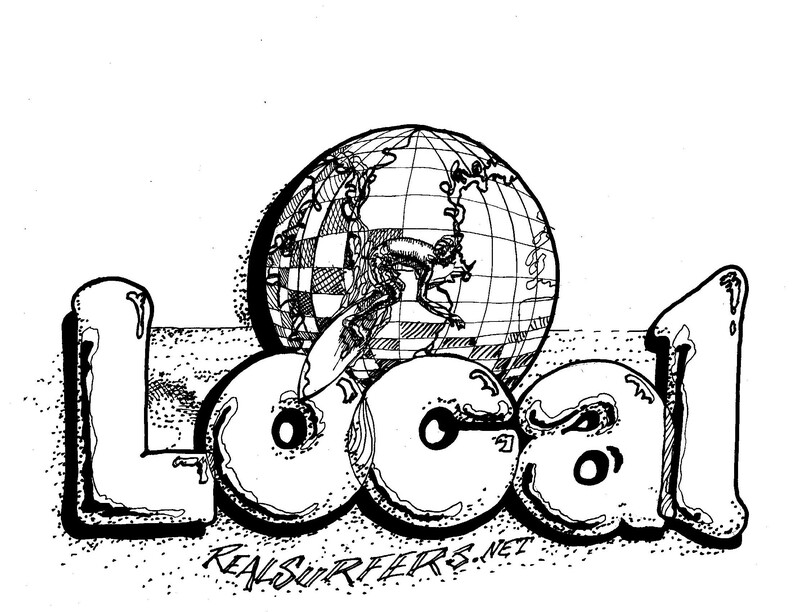 It’s supposed to read ‘world local.’ I’ll probably go back and put the globe into the lettering as I did in the lower graphic. And, since I have copies, I’ll, no doubt, be coloring these two. It’s meant to be ‘world local-er’ as in, perhaps, just a bit… yeah, you get it; a homeless person who sleeps under the pier is obviously more local than you. It means something to me that the father of modern surfing and I were both born on August 24th, sixty-one years and an ocean apart. 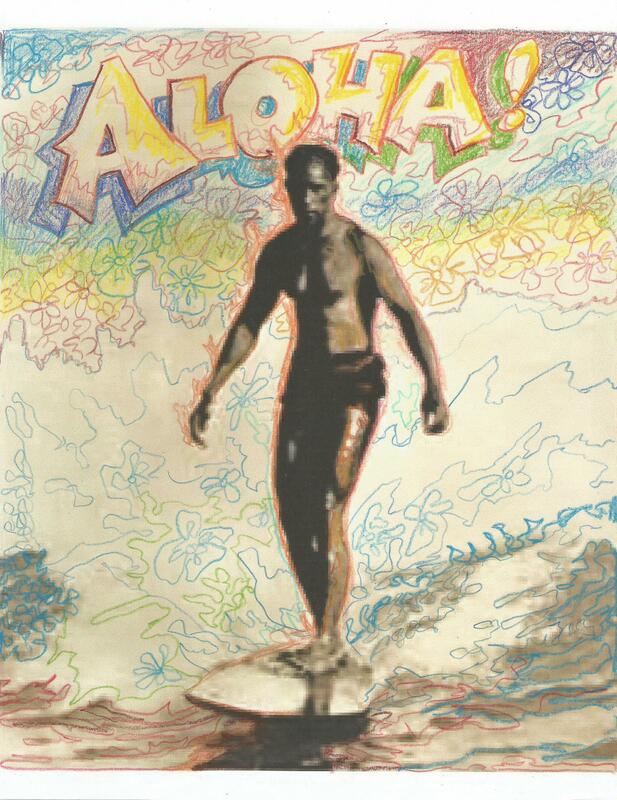 Duke Kahanamoku personified the Aloha spirit. Hey, man; I’m working on it.